What Is Tsiknopempti in Greece? Tsiknopempti is the Thursday during Carnival, the Greek Mardi Gras. It takes place 11 days before the start of Greek Orthodox Lent. In 2019, Tsiknopempti is February 28 and Greek Lent begins on March 11. Tsiknopempti signals the start of the last weekend that observant Greek Orthodox Church members are permitted to eat meat before fasting for Lent. 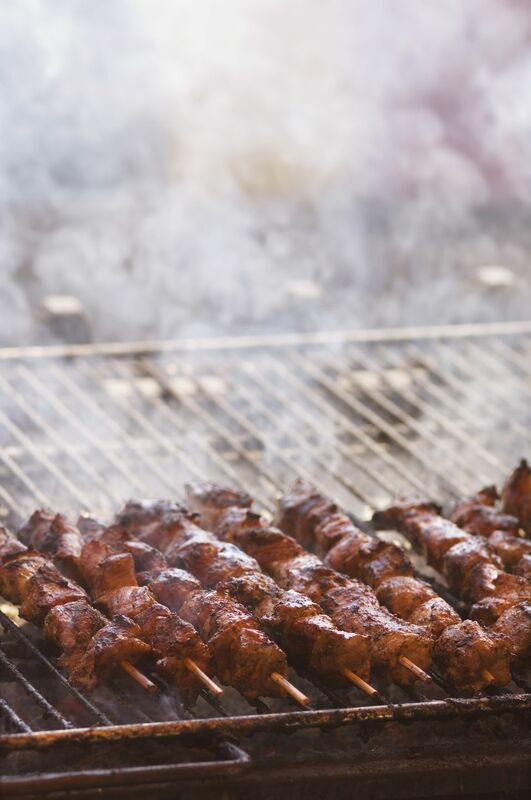 Naturally, everyone rushes to prepare and enjoy their favorite meat dishes for Tsiknopempti, which gives it one of its other common names, "Smoke Thursday" or "Smoked Thursday". It is also called "Barbecue Thursday" or "Grilled Thursday" by some. It's a popular day for going out to eat and enjoying as many different meats as possible. It can also be called, as a joke, "Feast of the Carnivores." This is definitely not the day for sensitive vegetarians to visit the the "restaurant rows" of Greece. They say that Greeks try to consume enough meat on this day to carry them through the entire 40 days of lent. So there's plenty of smoky air, redolent of the aromas of cooking meat, everywhere. By the way, the day is celebrated on a Thursday because, for observant Greek Orthodox Christians, the traditional fast days - when they abstain from meat throughout the year - are Wednesday and Friday. This is one of the few times of year it's a good idea to make a reservation - even at the most casual taverna - as families come out in force to consume vast quantities of grilled meats and every where will be packed. And if you are a vegetarian or a vegan planning your Greek vacation, why not put it off a few weeks and plan to travel during Lent. Almost all the tavernas, cafes and restaurants will be adding particularly appealing vegetarian dishes to their already veggie-rich cuisine for the month of abstenance. In English, Mardi Gras means "Fat Tuesday" and so Tsiknopempti is sometimes also called "Fat Thursday." In Greek letters, Tsiknopempti is Τσικνοπέμπτι. In Greek, Thursday is Pempti (Πέμπτη), meaning the fifth day of the week as Greeks count Sunday as the first day. The word tsikna (Τσικνο) refers to the smell of cooked meat - however, "Smelly Thursday" has not caught on as a translation. Meat is king, with the emphasis on grilled meats, though the occasional stew pot will be visible. Some hotels and virtually every taverna will put on special menus for Tsiknopempti. By far, the most common item will be some variation of souvlaki - meat on a stick. These will be available everywhere along the streets in the taverna areas; be sure to walk carefully to avoid banging into an unexpected grill in the already narrow streets and walkways. Souvlaki skewers in the hands of the inexperienced can also be causes of mild injury. Since eating is the main activity in Athens on Tsiknopempti, it can actually be a good time to visit the museums and monuments, which will be quiet even by the standards of the off-season, especially later in the day. Greek communities around the world celebrate Tsiknopempti, and Greek Orthodox church groups may arrange special events. Greek restaurants catering to local Greeks will also add on specials for the day or weekend; this is less likely in a restaurant with a mainly non-Greek clientele. Cities with "Greek towns" are also likely places to enjoy a taste of Tsiknopempti outside of Greece. Some of these include Chicago, Illinois; Toronto, Canada; and Melbourne, Australia. Cyprus also vigorously celebrates Tsiknopempti, with parades and other events. You can read an account of Tsiknopempti on Cyprus. An equivalent of Tsiknopempti is also celebrated in Germany and Poland, but there they adhere to the Western calendar for Easter, so the date differs. Most Eastern Orthodox and Greek Orthodox church calendars will be in alignment for Tsiknopempti and the rest of the Carnival, Lent, and Easter seasons, but there are some exceptions for faith groups adhering to a different variant of the old calendar, so be sure to check. Greeks seem to have an affection for holidays that fill the air and make it difficult to see or breathe; the popular flour-throwing festival is a less-fragrant but still a cough-inducing holiday. Pronunciation: Tsik-no-pem-ptee, with the "p" softly sounded, nearly like a "b" or even a "v".